Jack Holder is the new Panthers number one. Panthers chief Ged Rathbone is determined to enjoy every minute of his first season as the city club’s owner. The North-East businessman, who has been promoter for the past two campaigns, completed a full takeover during the winter. That has only served to fuel his excitement ahead of a 2017 season in which Panthers will go in search of glory in the newly-named SGB Championship. And a new-look line-up - featuring five new signings and two returning riders - will take to the track for the first time this Sunday. Panthers entertain the full intended Coventry line-up in a noon clash at the East of England Showground. The Bees are a top-flight club who recently pulled out of racing this year due to stadium and financial concerns. Rathbone said: “It’s all about enjoyment this year as far as I’m concerned. The fact we want to be successful never changes, but we’ll be doing it with smiles on our faces. “We’ve built a side that we believe in and boasts massive improvement right across the board from number one to number seven. “Sunday is the start of the new era and the first chance for our fans to see the new-look team in action. Hopefully they will turn out in force to show their support. “We’re also expecting plenty of Coventry supporters to make the short trip across to the East of England Showground to make themselves seen and heard. It is very important the sport is saved there. “It could hardly be a tougher start for us in all truth either. Rathbone revealed Panthers bosses won’t settle on their final riding order until after the club’s Press & Practice Day tomorrow (Friday). 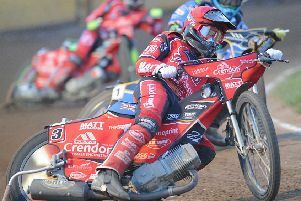 Aussie capture Jack Holder is certain to start at number one, while New Zealand champion Bradley Wilson-Dean and British prospect Tom Bacon will fill the reserve berths. New signings Kenneth Hansen and Paul Starke, and returning pair Ulrich Ostergaard and Simon Lambert, will be in the main body. The Coventry side boasts plenty of Alwalton expertise. Their side is spearheaded by former Panthers star Kenneth Bjerre and British champion Danny King. The visitors will be managed for the day by Gary Havelock - the club’s team boss in recent seasons and a man who rode for Peterborough more than a decade ago. Normal admission prices apply. They are £16 for adults, £13 for concessions and £5 for juniors aged 10 to 16. Children under the age of 10 are admitted free with paying adults.